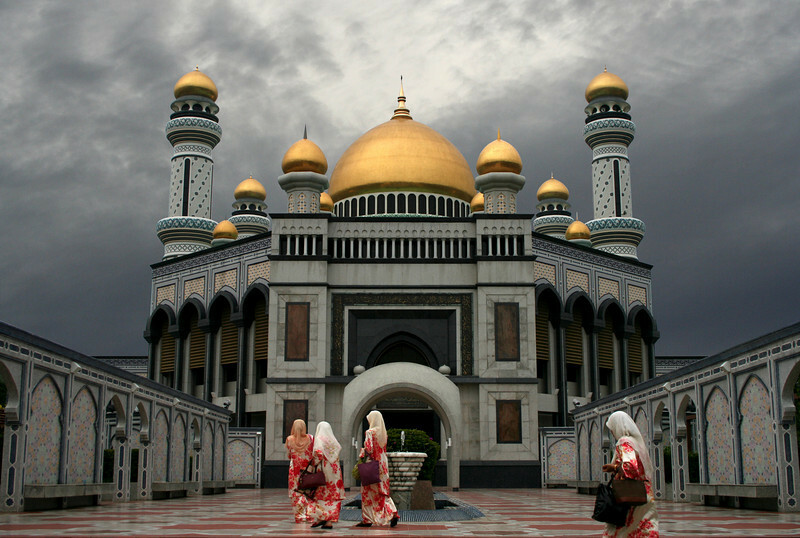 Hassanal Bolkiah Mosque is the largest in Brunei and was built in 1992 to commemorate the Sultan's 25th anniversary on the throne. A lavish building inspired by the Dome of the Rock and the Alhambra, it features 29 onion domes - a reminder that the present Sultan is the 29th in his line to rule Brunei. Each dome is covered in a centimetre-thick layer of solid gold tiles. The mosque was designed by an Australian architect who fell to his death from scaffolding during construction, and - according to the tour guide - "burst like a tomato". Very nice photo. Love the colors, and glowing domes.